Michael Mahan at Worth Avenue Yachts reports a $235,000 price drop on the 26.8m motor yacht Essence. 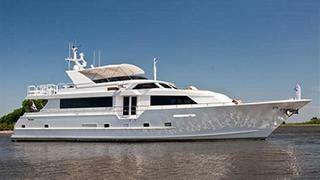 Built by Broward in 1999 and refitted in 2009, Essence sleeps six guests in three double staterooms while twin 1,350hp Caterpillar engines give her a cruising speed of 14 knots. Lying in Palm Beach, Florida, Essence is down from $1,990,000 to $1,755,000.